Cycling beside Lake Balaton is fantastic. I come Spring, Summer and Autumn to cycle the endless and breathtakingly beautiful Lake Balaton. No crowds; just miles and miles of cycling paths, with plenty of stops en route for drinks, ice-cream, langos and other Hungarian specialities. I highly recommend it. The Balatonkör is a 200 km cycle ride around Lake Balaton. 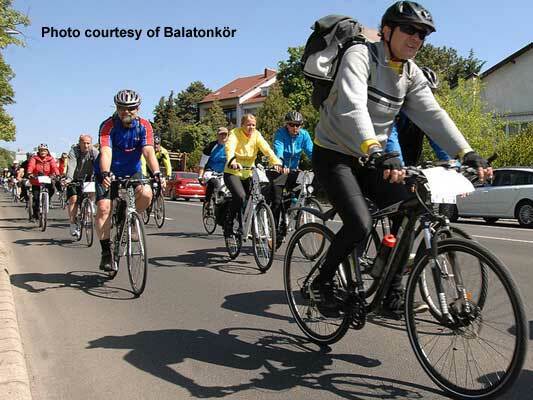 Unlike the Tour de Pelso where everyone cycles as fast as they can around Lake Balaton, the Balatonkör involves cycling as a group around the lake starting at 6 o'clock in the morning and finishing at about 9 o'clock at night. People of all ages and abilities take part. The cycle route around Lake Balaton is over 200 kms long. The route consists of dedicated cycle paths and quiet side roads. The route on the Southern and Western parts of the lake is fairly flat. The route on the Northern and Eastern parts of the lake is fairly hilly. Wherever marked cycle routes exist, cyclists should use the cycle routes in preference to main roads. Everyone is expected to be self sufficient; everyone should carry a pump, a puncture outfit and in the event of a puncture, have the ability to mend a puncture, or to look helpless enough to get someone to fix it for you. 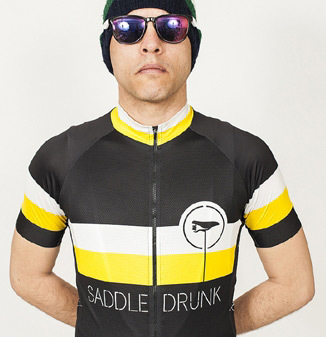 Alternatively, take at least one spare inner tube. The Balaton cycle route may have lots of cycle traffic in the Summer and on sunny weekends; at most other times, the cycle route is quiet. The annual 204 km. 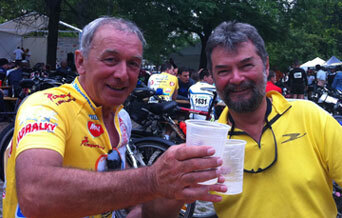 bike marathon around Lake Balaton took place this year on 6th June. Time allowed to complete the marathon is 10 hours. For the fastest cyclists, it is a race but for the vast majority of competitors, the Balaton Marathon is exactly that, a marathon not a race. Most competitors only attempt to cycle all the way around the Balaton once a year, on the day of the marathon, so just getting all the way around in under 10 hours is a major feat in itself. This year, in temperatures of over 30 degrees and at one point 35 degrees in the shade, it was tough going. Lots of people suffered with the heat, lots dropped out and some like me, cut the marathon short and came over on the ferry from Tihany and then cycled back to Siófok to meet the brave that completed the 204 kms. (My bike speedo showed 168 kms completed). Our secret weapon, Stefano Dall'Aglio of Saddledrunk racing team came over from London to stay with us and to boost the Peugeot Maté team's results and completed the 204 course in 5 hours 57 minutes. 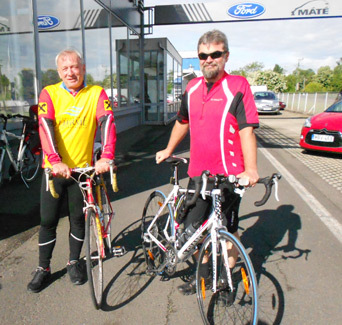 Getting ready for the 2014 Tour de Pelso, Balaton Marathon. The 2013 marathon completed; the first pint was drunk faster than the photo could be taken! László Sztecovics on left, László Lipót on right.